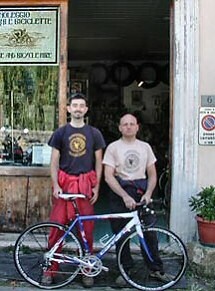 Marco Ramuzzi is on the right. I once got his name wrong and called him “Marco Pantani” (confusing him with the famous shaven-headed Italian cyclist). Marco R replied: wrong surname, but we share the same hairdresser! Cycling is the Italian national sport, and you are bound to encounter Lycra-clad groups of cyclists of all ages on the roads around Ripertoli. So it’s not surprising that there is an excellent bicycle and moped shop in Greve, owned by Marco Ramuzzi, from which you can easily rent mountain and normal bikes, or 50 cc mopeds. I don’t recommend cycling from Greve, because it is steeply uphill all the way, but the ride to and from Panzano is somewhat less demanding and has beautiful views. 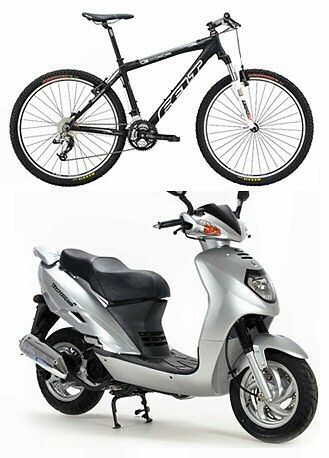 Mopeds can be a good solution for guests aged 18 and over who want their own transport but don’t want to rent a car, and Marco will deliver to Ripertoli if you wish, so that you can practise inside the grounds before venturing out onto the roads. They can cope perfectly well with the hills, and a trip to Florence on a moped is entirely realistic if you are feeling brave, as my son Giles used to demonstrate when he was 18. Marco’s website is www.ramuzzi.com. He knows Ripertoli well, and is very friendly and helpful.